I'll post about junk tomorrow. Good night all. As usual one sees all kinds of characters at the flea market. This is Robert, he's a dealer there, and fairly well know. Take a look at his friend on his scooter. Now you know how I love clocks, and I just loved this display. I'm so tired, and tomorrow is another day, so I'll leave you with this for now. Thanks to everyone who left a comment on my wreath/skate/sled creation in the previous post. I'm feeling a lot better about it now, and am anxious to get started on the "real decorating". Hopefully I'll come up with lots of christmas T2T ideas. I'm fortunate that there are a lot of creative people out there, who are letting me use their ideas on my web page. Watch for Christmas T2T ideas all month, and I've started a Christmas page on my web site. I'm selling again this month with Linda of Linda's blue gate. This is a pic of part of her display. You can see a couple of my items in the background there, on the upper right of the pic. Wish us luck, this is the last big weekend before Christmas, I hope to sell out. If you will be in Canton, please stop by. We are on Antique row just down from the civic center. Look for her houses, you can't miss it. I'll be there in the afternoons on Thursday, & Friday, and all day Saturday. Come on by and say Hi. I had purchased an old sled during the summer for $6.00 and it's been sitting in my barn just waiting for Christmas. I almost forgot about it. Also I'd gotten this idea for a wreath last year that was in my idea book, I've had my eye out for old ice skates all year, I found these for $2.00 in the Summer. Then I took an old tired wreath I had in my "worn out christmas stash". Fluffed it up, glued some picks that I had in a box, added the skates, and then mounted the whole thing on the sled. right now it sits beside my side entrance (the one we all use). It's a little lonely at the moment but I'm getting to Christmas Slowly this year. Entire cost $8.00, love it!!!! In the spirit of the season I've decided to highlight some of my fellow bloggers that have stores with great items for you to add to your Christmas giving or getting list this year. They are in no particular order. I challenge you to do the same on your blogs and maybe we can drum up business for each other. 1) Katie's Rose Cottage, Shabby Chic for you and your home. I have these great old chemistry bottles that have numbers on them. I put buttons in them and have them in my craft area. I got some chains, and charm bracelets and just draped them over the bottles to have a place to put them, but I really like how they are looking just sitting there on the bottles. I've also seen bracelets displayed on upside down wine glasses as well as teapots. Makes them pretty to look at even when you aren't wearing them. Since the weather here in East TX is so awful today. 40 degrees and rainy, I've been doing things inside. This evening I made a few jewelry items. These are Swag Pendants and I'll be adding them to my Jewelry store soon. These 2 pendants are made from bits and pieces of Items I've picked up at garage sales etc. I think they make cute pendants. Sorry the pics are blury. Just so you will know, from now until Christmas, all jewelry orders over $10.00 will have free shipping. I hope you've had a great Saturday, and stayed warm and dry. We had a great Thanksgiving with Family and now it's full speed ahead with Christmas. I hope to have some great Christmas T2T ideas on my web page in the weeks to come. But for now, I've made some more sun catchers/garden chandies. I'm also getting all of my inventory packed up and priced for this next weekend's flea market. I started working on my hutch for Christmas, I'll post some pics as I get it all worked out. I still have no desire to get the Christmas stuff out of the barn just yet. That is such a chore. I'll probably wait until after next weekend. I may just do the porch and hutch this week, and worry about the tree next week. I hope everyone has a great Thanksgiving day. Lots of Food, Love and Family. And if this is not Thanksgiving for you (aka Canadians etc) you can think about how all us Americans are full to the brim with Turkey, and Cranberries, and feeling quite fat and uncomfortable as we watch football, or fall into our post Thanksgiving coma. As you all know I love the graphics of numbers and letters, I guess this also ties in with my love of clocks. My love affair with clock goes back to, I don't know when. But in the last few years, it has really grown. I guess I'm not the only one either, as you can find those big face clocks everywhere now, but not when I was really looking for one. I've decide to do a Clock themed Christmas this year. But alas, there are few to none clock Christmas decorations. What's a girl to do??? Make her own of course. I have lots of clock faces around the house, I've scanned a few and then decopaged onto these ceramic blank ornaments. I also added some ribbon to hang some clock faces right on the tree. I'll be doing more but here's what I've got to start with. I also picked up these beautiful hands today at Hobby Lobby. I'm sure I'll incorporate them into the theme somehow. here are a few other clocks around my house. I'm sure I'll deck some of the clocks out with some festive fanfare, and maybe come up with some more ideas to fit into the theme. IF you know where I could find Clock Linens, wrapping paper, etc please Let me know. Well my first Prism project hit me yesterday morning. I have lots of door hardware, and, right now, no projects for it. So I decided to add some of those crystals/prisms to them and make me some sun catchers. Ok, so I went a little crazy and made some more. While I'm at it, maybe a small chandie for my bird cage. Many of these are available in my store. I picked up these two strange items for the crystals only. We'll call the first one a lamp thingy, and the second are sconces. Look for projects with crystals in the near future. But for now I'm left with this unique item. It looks to have been part of a lamp at one time. It is solid, and heavy iron. My mind is buzzing with ways to use it. I'm thinking of something for the holidays. Do ya'll have any ideas??? In case you are wondering I'm thinking of giving the sconces to a friend, I know she could use them for a project in her T2T world. Happy Weekend, and good hunting to you all. Well after my success at First Monday Trades Days last month, I've been working to get ready for the next sale. it's been fun, but sometimes, it's just mundane. As another junking friend recently said. "Making one of something is fun, making lots of the same thing can be a bit boring." Well, I'm not bored, but I am working in an assembly line fashion on some things. Here are some framed bottles I've made for the next sale. They sold well at my Barn sale, and the 1 I had last month was sold too, So I thought I'd make as many as I could. I usually just add keys to them, but this time I gave some of them a little Bling. you can't see it real good, but the one with the begonia, has a crystal tear drop on it. I got inspired last night between 12-1:00am when I was looking through my longaberger catalog at the So Rachel line of Jewelry. I decided to try to copy their Swag Design. I just love this piece, and it is designed to be hung on a bag, or belt loop, or purse, or just about anything you want to hang something on. Look real close and you'll see an old timey car. On the other side is an eagle. Well that is my fun for the last few days. I'm going to be making some more of those swags today, and a few other things. I would like to challenge all of you creative gals to show your Creative Space. Not the usual, ready for a magazine cover, picture. But one that shows it the mess that it can become when the creative juices get flowing. LMK when you post your picture, and I'll pop over to look at it. Just for starters, here is my "indoor" creative space. Now for some of the creations. As you may know I make Earrings and other jewelry out of watch faces. Well when I've removed all the watch faces I end up with a lot of left over watch parts. What to do with them??? Well right now, I just mainly throw them in a box, but I am coming up with some creative ways to use some of that "trash". In some of these, I've copied some old pictures I have and then cut a small enough piece and decopaged it inside of the glass of the Watch. On other's I've used actual dried flowers, or scrapbook paper images. I'm doing some right now with old stamps and words from an old dictionary. The possibilities are endless, and I've got lots of these things. This is fun. BTW If you like my jewelry you should see what my blog friend Jamie can do. She puts me to shame, and actually, inspires me more than you could know. 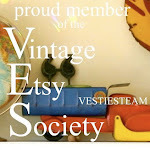 here, and then pop over to her Etsy shop to see her beautiful creations. Here are a couple of things I've been working on. First is this old tool box. It was lacking something. So I added some spindles and I think It is much better now. Here is my latest jewelry creation. I call it a pendant shadow box. This one has a watch face, clock hand and misc gears on a fabric background. I'm feeling a little beat down today, because I had to deal with the Customer Service Department from H*() today. I don't understand how companies can think that having Customer Service Agents, who can barely speak english or understand it, is actually Service. I'll opt for the Spinal Tap please. This situation actually brought me to tears, and thankfully DH helped me out. I am just not cut out for Computer technical problems. Give me Junk to play with anyday.